Ron Jowers has sent these old photos to Johnny Brackstone and I think they are worth sharing. 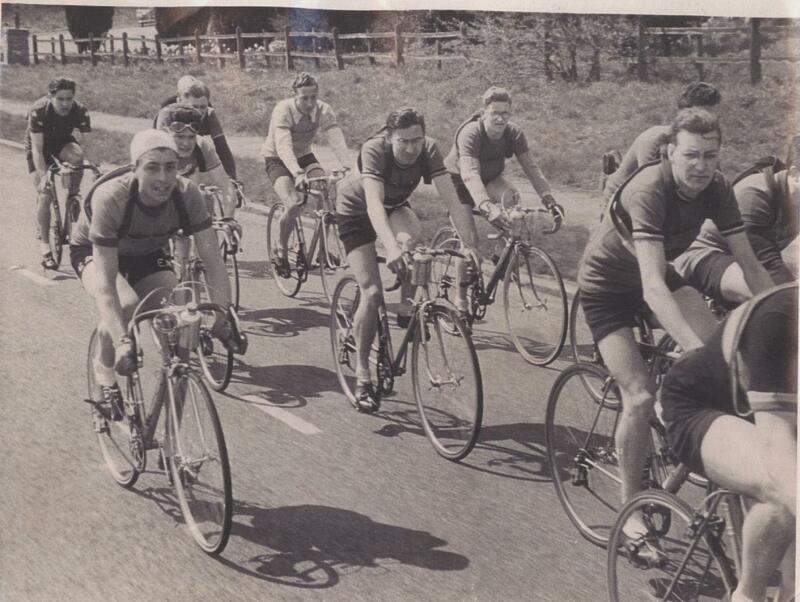 I believe that Ron started in the Ealing CC then moved to the West London RC and later to the Twickenham CC. In the late fifties he was a top tester and was unfortunate to have Bryan Wiltcher to contend with. Photo no.1 The bunch on Western Avenue (A40) in 1951. Ron Jowers, in white cap left foreground, won. Others include Ron Loveday and Cliff Thayer. 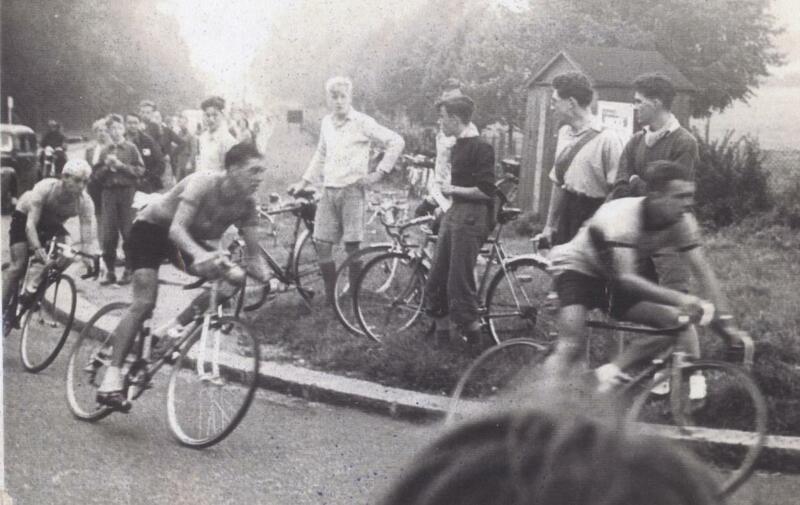 Photo no.2 Tour of Chilterns, the winning break of Brian Robinson, Ron Jowers and Fred Krebs. Ron says it is 1952 but Gino Goddard insists it is 1953. Robinson and Krebs both rode with the Hercules team in the 1955 Tour de France. 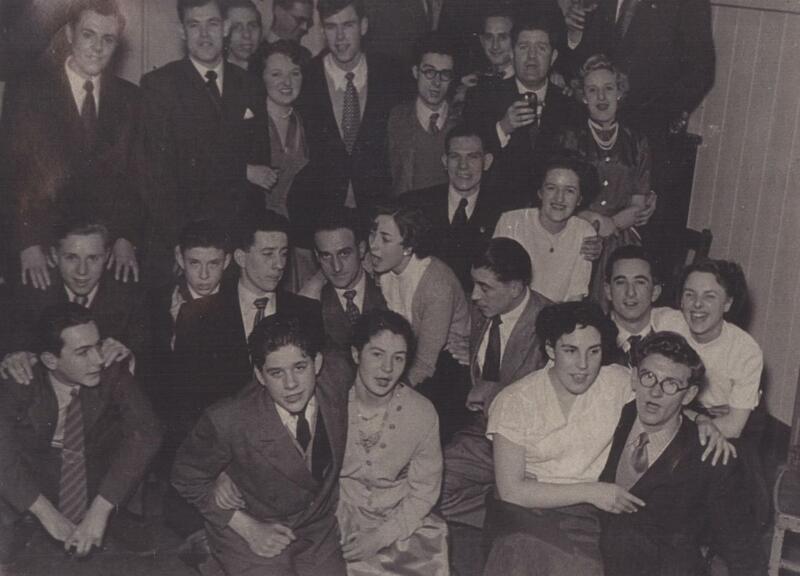 Photo no 3 Ealing CC Dinner and dance at Northfields 1950. Front centre is John Morris currently of the Pickwick club. Ron Jowers is in the second row side on to the camera. Photo no.4 The break again on the Western Avenue this time in 1950. Ron Jowers (winner) is in second place. 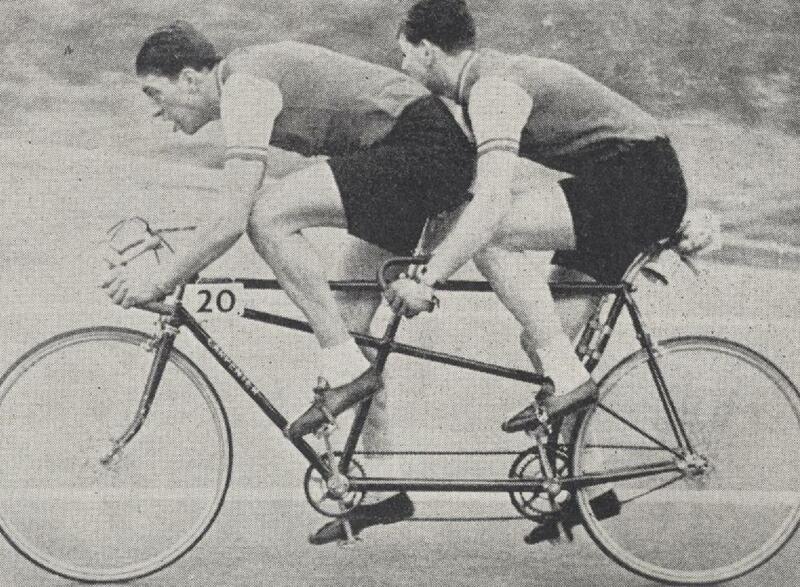 Another photo of Big Ron, this time on a tandem. Albert Beurick, Tom Simpson’s biggest supporter, died last night in Gent at the age of 72 from a heart attack. He was the owner of the Cafe Den Engel where Simpson stayed when he first moved to Gent. Mr Breurick never missed an opportunity to defend Simpson’s reputation and while he didn’t deny that he used drugs he claimed that their use was universal so there was a level playing field. This claim upset other riders of that generation, including Vin Denson, who insisted they had ridden clean. Mr Breurick will be cremated at Lochristi near Gent at noon on Friday. Former Tour of Flanders and Paris-Roubaix winner Eric Vanderaerden (47) yesterday won the first EXQI City Bike race at the Old Market in Leuven. The Limburger outsprinted Etienne De Wilde and Johan Museeuw. Twenty two old pros participated in the race which lasted an hour. 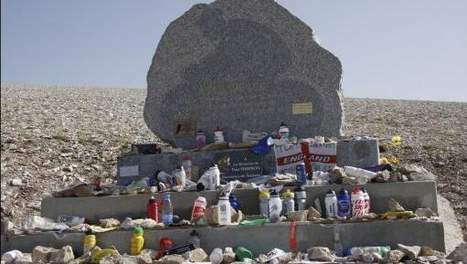 Among them were Nico Mattan, Fons De Wolf, Lucien Van Impe, Roland Liboton, Serge Baguet, Jo Planckaert, Marc Wauters, Ludo Dierckxsens, Frank Harrison and Ward Sels. It was a pilot edition of a new cycling competition which EXQI Sport TV channel will roll out next year. In the period March to June 2010 races will be held in ten different Belgian cities. There will be separate competitions organized for professional cyclists, former cyclists and emerging talent. The races will be shown live on Belgian TV. I have only one question, who the hell is Frank Harrison? Jesus Manzano; a profit without honour? This is what ex-Kelme rider Jesus Manzano told L’Equipe in June 2007. Does this explain how somebody could be tested a zillion times and always come up clean? I should point out that Manzano was sacked by Kelme when he was found with a woman in his room on the 2003 Vuelta! This could influence his views about his former employers. I want to give you an example, something I’ve never spoken about except to the police up until now. It concerns one of the four Spanish Laboratories credited by the UCI. This laboratory who is in charge of sending the “UCI” vampires (doctors)to take the samples during the Vuelta and other races is the same lab that’s in charge of the doctor visits to the cyclists, they follow the cyclists and give them the stamp of approval on their licenses. The owner of this clinic, a renowned hemotologist, called Walter Viru, who is one of the doctors for Kelme to alert them the day before the uci vampires were coming to take the samples from the cyclist. And he did the same thing with Del Moral, the doctor for the U.S. Postal team and then Discovery, a good friend of his.